Men of the Ondo State Command of the Nigeria Security and Civil Defence Corps, NSCDC, have apprehended two suspects allegedly involved in crude oil theft. The suspected illegal oil bunkers: Francis Ogbe and Kelvin Analogbe, were nabbed with a truck loaded with 33,000 litres of suspected crude oil. Also found with the suspects, who were arrested in Ore, was a towing vehicle suspected to be used for their illegal activities in the state. 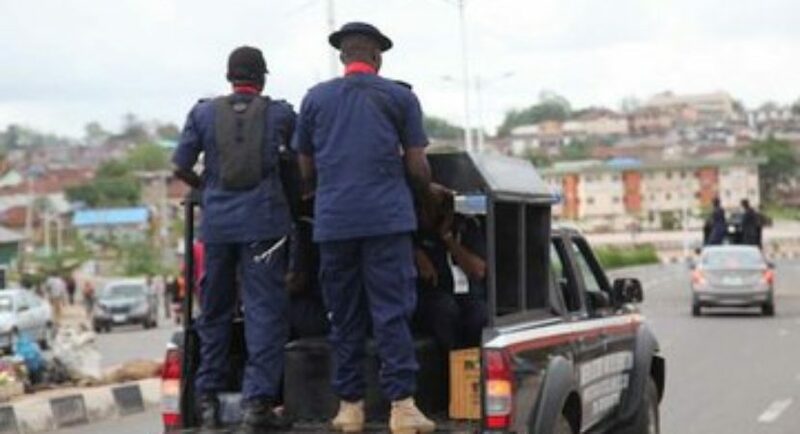 State Commandant of the NSCDC, Pedro Awili, who made the disclosure while parading the suspects on Thursday at the Alagbaka head office of the corps in the state, disclosed that the truck, toying van as well as the two suspects were arrested on January 19 along Benin/Lagos expressway, Ore in Odigbo Local Government Area of the state. He further maintained that after necessary investigation, it was revealed that the tanker, which was on transit through the state, was coming from Port Harcourt and was heading to Lagos before it was intercepted by his men. Awili also assured that the driver of the truck, who fled upon sighting security agents, would be nabbed as efforts are on to track him. The two suspects are still under investigation and will be charge to court immediately after the conclusion of the investigation. “The truck has the registration number: Lagos LSB 08 XM, conveyed 33,000 litres of suspected crude oil. “The suspects are already assisting at apprehending the driver of the truck who is currently on the run,” Awili said. He, therefore, assured that the corps would put more effort in bringing an end to illegal oil bunkering in the state.